We are a small-town dealership that is committed to providing a family-like friendly atmosphere and a personalized experience. The Dodge Ram 1500 comes in a multitude of different trims to suit everybody's needs and budget! This truck does everything you need it to do and more, and for a great price. When the engineers and designers created the Dodge Ram 1500, no detail was overlooked. From soft-touch materials, well-planned storage spaces throughout, responsive handling and a world-class lineup of engines available, you can choose the pickup truck that perfectly fits your lifestyle and needs. This truck offers a class-leading selection of engines such as the 3.0L EcoDiesel V6, 3.6L Pentastar V6, or the 5.7L Hemi V8. There are plenty of reasons to choose a Dodge Ram 1500 near Essex - it's an all-around fantastic light-duty pickup truck that takes you from work to play and everything in between. 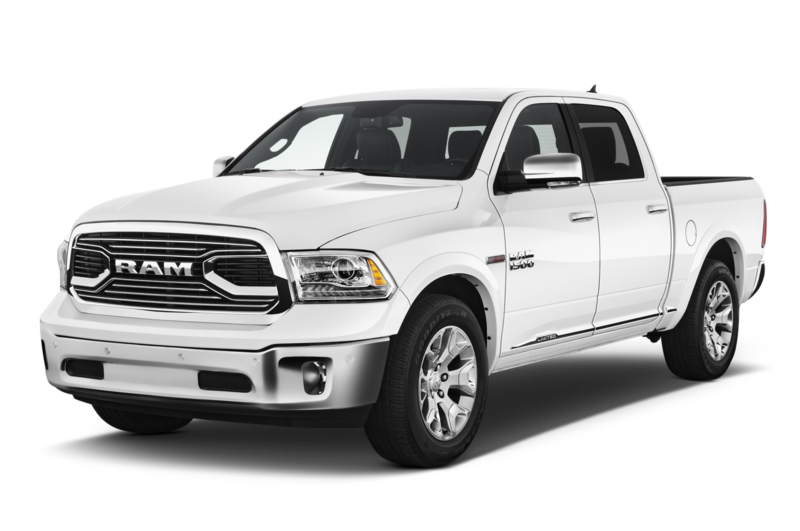 Now that you've decided that the Ram 1500 is the truck for you, it's time to choose a dealership that will offer you excellent value, support, selection, and a great buying experience - that dealership is Leamington Chrysler! If you're looking to buy a Dodge Ram 1500 near Essex, then take the drive over to our dealership located at 170 Oak Street West in Leamington. We offer financing options to suit different lifestyle needs and budgets. Instead of the glamour and expensive showrooms that larger dealerships offer, we prefer to take a simpler approach. We focus on giving you great prices, building relationships and striving for a high level of integrity in everything that we do. So, if you're looking for a dealership that consistently puts your needs first and offers you affordable rates on vehicles, parts and services, then we encourage you to visit us for your next Dodge Ram 1500 purchase. Our knowledgeable product specialists will be able to help you find the perfect truck to meet your needs by laying out your best options across different trim levels, prices and years. We also have an in-house finance team that will help you finance or lease your purchase. We do our best to approve everyone, and we can help you improve your credit score and get you behind the wheel of a truck you'd love to own! To us you're more than just a number. Receive customized service based on your unique needs! We are a small-town dealership with fair and affordable prices! We treat customers like family, not like a business transaction. When you visit us, you're treated with the same respect, honesty and integrity that we have for our family. We blend modern technology with the business values of your grandparents' generation. When you visit us, you gain a dealership experience that's different from the big stores. Get your Dodge Ram 1500 near Essex from Leamington Chrysler! One thing that truly sets us apart in terms of customer service is that our commitment to provide exceptional service extends long after the sale and throughout the life of your vehicle. Anytime you need any automotive support we are here for you. Whether you're buying a new vehicle, or you need a repair or service we are here every step of the way. Visit us at Leamington Chrysler and experience a dealership that rewards you. We offer in house-financing to help you get behind the wheel of your new Dodge Ram 1500 quickly and affordably! Enjoy the convenience of our financing department at our dealership, and achieve an affordable solution for purchasing your vehicle. Our finance specialists will work with you and review all of your options so that we can find a solution that works for your life and budget. Find Your Dodge Ram 1500 near Essex Today! The first step towards finding your new truck is to view what we have to offer you online using our simple inventory search tool. You can browse by model, year, odometer reading, and price so you can narrow your search and save time! Of course, we welcome you to come to our dealership and test drive as many vehicle's as you'd like until you've found the perfect one. Begin your search online, give us a call, or stop by our dealership! 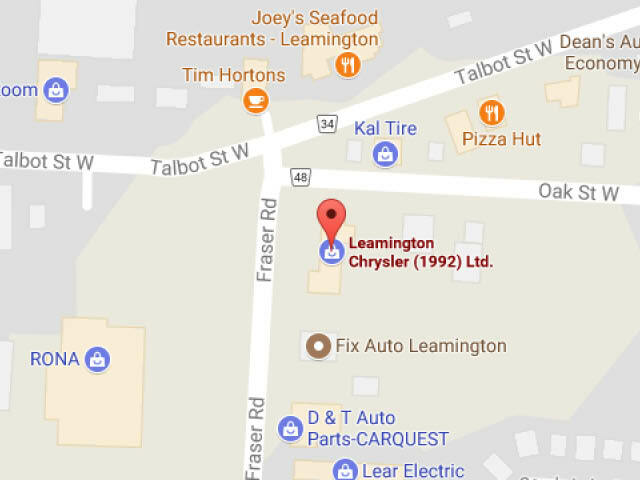 At Leamington Chrysler, Dodge, Jeep, Ram located at 170 Oak St. West in beautiful Leamington we treat the needs of our customers like they are our own. We are a family-friendly, single point store without all the hustle and bustle of the big franchises. We proudly serve the surrounding areas of Harrow, Kingsville, Amherstburg, LaSalle, Windsor, Tecumseh, Essex, Belle River, Tilbury, Chatham and Blenheim. We are a small-town business, with a simple plan: to employ today's technologies in a customer focused environment free of the glitz and glamour of many modern dealerships but heavy on the relationships, values, and integrity of your grandparents' new vehicle purchase experience. Leamington Chrysler is pleased to announce that in addition to financing, leasing is back! Chrysler, Jeep, Dodge and RAM customers can now lease virtually all 2017 models including RAM 1500 and Dodge Grand Caravan for up to 60 months. There is a financing option to suit all lifestyles and budgets. It's a beautiful drive to 170 Oak St. West, right on the shores of Lake Erie. Make a day of it and visit Colasanti's Tropical Gardens, or take a tour of our picturesque local wineries or spend the afternoon at nearby Point Pelee National Park. We'd love to meet you and help you find the Chrysler, Dodge, Jeep or RAM vehicle that is right for you. Thank you for visiting our website and we hope to see you soon. For more information feel free to call us toll free at 1 (877) 511-2927 and speak to our friendly sales staff. We are conveniently located in Leamington less than 30 minutes from Harrow, Kingsville, Wheatley, Essex and Amherstburg. Like us on Facebook or follow us on Twitter to get all the latest news and special offers! The Service Department is outstanding. Not only will they repair at very fair costs, but they provided "after service" attention when I needed to come back a day later for an unrelated service matter. Unlike so many dealerships, Leamington Chrysler really cares about customers and customer service - I will now return and purchase and car at a later date - these guys are the best! I drove from London to see these guys. They had the 2014 Chrysler 200 I was looking for. They were reasonably priced and easy to deal with. I enjoyed dealing with a smaller dealership and it may just be my impression but they seemed friendlier and less full of pressure during the entire process than places I have dealt before. Recently purchased a Jeep Cherokee from Leamington Chrysler. We could not be happier with the sales and service that we have received over the last 15 years. If you are looking for a new Chrysler you may want to give them a call.